I spent a few evenings purging a lot and the rest of it I cut into 6 x 6" and sorted by colors. I did save some of my fav scraps (in the plastic bags sorted by colors). In the drawers I also found some kraft & Hero Hues layering papers all ready to fold and score to A2 sized card bases. Here is a before & after shot! And here is a card I made using some of the scraps from the plastic bags ;)) I just love that color at the moment !! Stamp: Hero Arts All the Time CL584, Papers: scraps ;), Inks: Distress inks & Memories dye ink. 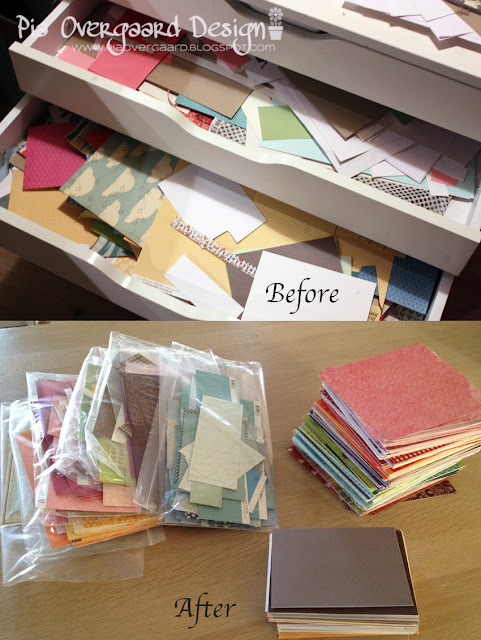 How are you organizing your paperscraps? And most importantly how do you keep it organized ;) ? Yes - I have exactly the same problem and like you sorted all my scraps into colours. I did throw a lot of tiny pieces away and your idea with the clear envelope looks good. I use envelops that are not see-thro - might change :). Lækker med orden i sine gemmer, også et af mine problemer, har forsøgt med et par forskellige løsninger, men ikke noget der er værd at skrive om. Det er et super flot kort du har lavet, kan godt forstå at du er vild med de farver. Jeg har ikke så meget mønsterpapir (bruger meget baggrundsstempler), men de rester jeg har kan sagtens være i en 32x32 æske. Vildt flot kort, kan godt forså de farver er blandt dine favoritter. Oh Pia - what an amazing card from scraps - love it. Love your organising too. Et utrolig flot kort du har lavet. 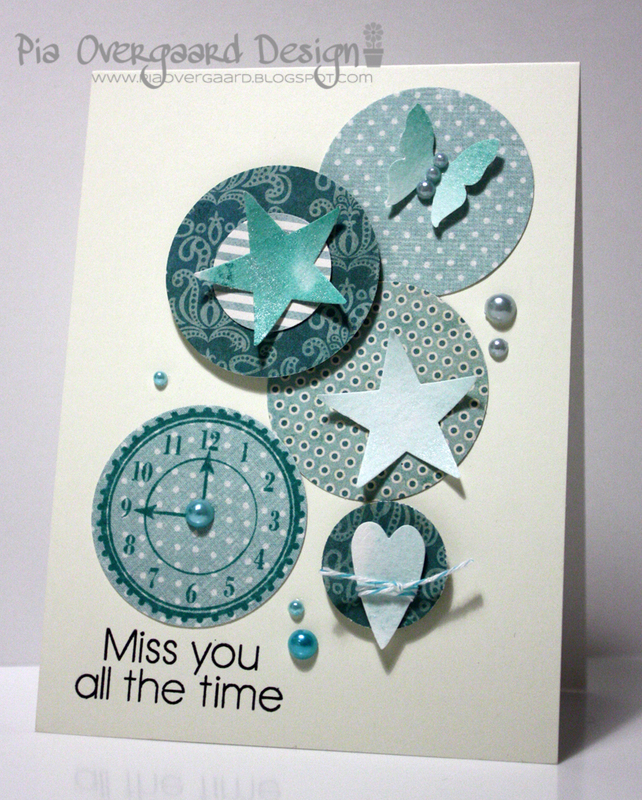 Beautiful card from scraps - thats why I like to keep mine too - they work inspirational!